UN Watch has been caught manipulating video footage in a propaganda video it produced with the aim of getting Cuba and three other countries kicked out of the United Nations Human Rights Council. The UN Watch produced a campaign video which included footage supposedly of Cuban police beating peaceful protestors. One of the most alarming clips was in fact taken from footage of Spanish police beating a group of unarmed Spanish youth sitting on the floor. 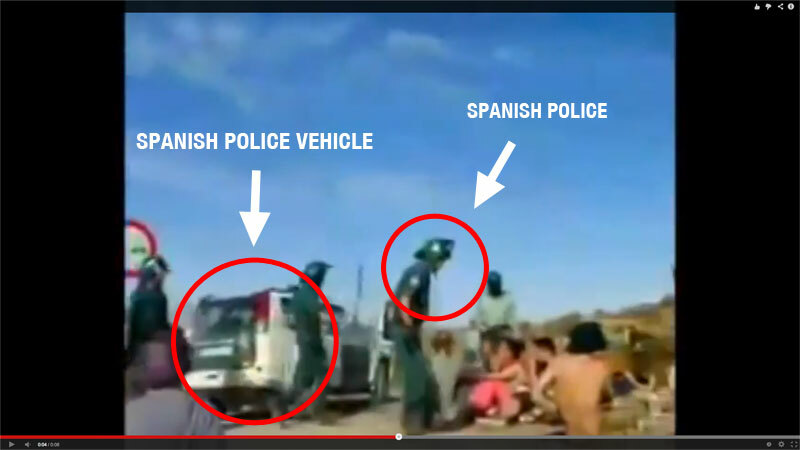 The manipulation was denounced on the blog La Santa Mambisa, and the website Cubanos en UK located the source of the original footage of the incident in Spain. Click here for more details. The video was launched at a lavish event by UN Watch during the VI Summit for Human Rights and Democracy held in the International Conference Centre of Geneva, Switzerland. 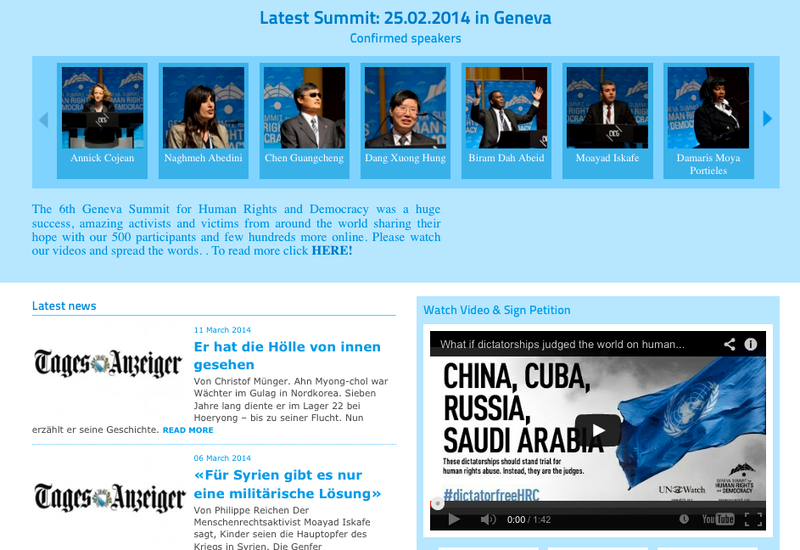 It was also posted on the home page of the NGO’s website. However, within hours of a campaign of condemnation for this malicious manipulation via social media, UN Watch has edited out the false footage (see their original video here) (see their edited video here). There has been no public statement nor apology made, but the fact that that footage has now been removed is evidence that UN Watch were aware of the false allegation. Clearly, the NGO was driven to manipulate this footage because it lacks evidence of real human rights abuses on the island. This tactic has been adopted widely in recent weeks in Venezuela, where the opposition has reposted video footage and photos from all around the world where real human rights abuses have occurred. The false propaganda has been picked up and circulated by the mass media, which makes no effort to verify the truth or falsity of this so-called ‘evidence’. Had UN Watch really wanted to find evidence of human rights abuses in Cuba, they would have found it in the illegally-occupied US military base in Guantanamo where ‘enemy combatants’ have been held in inhuman conditions, tortured, force-fed and denied access to family and legal visits. Most of them have never been charged or appeared in a court of law. The US has carried out similar human rights abuses around the world. The details for the international commission of inquiry into the case of the "Miami five" to be held at the Law Society next month have now been finalised. 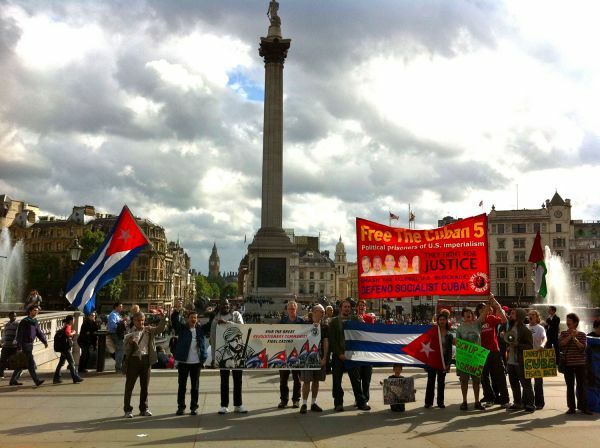 Among those giving evidence will be René González, the only member of the five Cuban men jailed for spying to have been released after completing his 15-year sentence in the United States. Venezuelan opposition shows its right-wing, racist and anti-working class character in the streets of Washington, D.C. 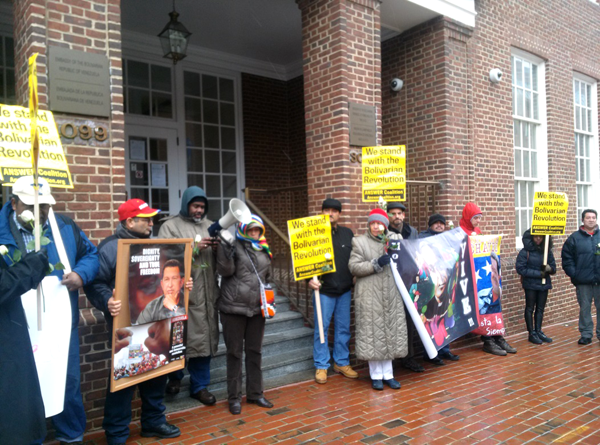 In front of the Venezuelan Embassy - Washington, D.C., Feb. 15, 2014. 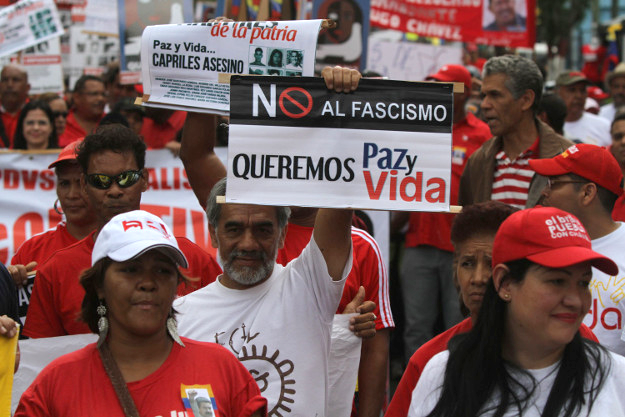 Yesterday (Sat., Feb. 15) at a demonstration in Washington, D.C., the racist, privileged and pampered character of the ultra-right-wing opponents of Venezuela’s revolutionary government revealed itself in a grotesque display. Vividly unmasking the true class nature of the opposition to Venezuela’s progressive government, the enraged children of Venezuela’s upper classes, who live a coddled existence in Washington, D.C., yelled insults and racist slurs against a multi-racial group of demonstrators who rallied for six hours to condemn the U.S. government and the CIA for trying to carry out another coup against the progressive government led by Nicolas Maduro. According to the author, this book owes its existence to serendipity. 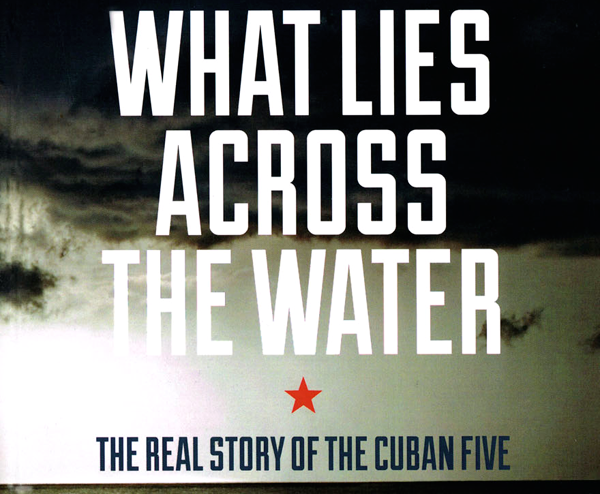 In 2009 Stephen Kimber was in Havana researching for a love story he planned to write when, he explains, he ‘got sideswiped by the truth-is-stranger-but-way-more-interesting story of the Cuban Five.’ (1) Thanks to serendipity, Kimber has produced the first full-length book in English about the case of the Cuban Five. During his research, the Canadian writer, broadcaster and professor of journalism read 20,000-pages of court transcripts, and a mass of books, media reports and documents. 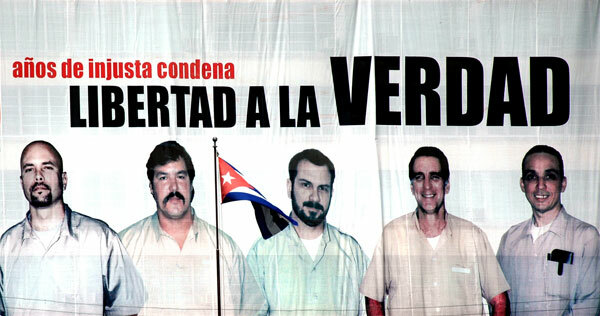 He conducted interviews and established correspondence with the Five in prison. The book is organized chronologically into sections which are sub-divided by diary-like entries providing updates on the entire ‘cast of characters’. This work is meticulously researched, factual without being dull and written with sensitivity and honesty - warts and all. It is as gripping as an action-packed movie and deeply moving. This is a fun romantic comedy starring British actor Nick Frost. His character (Bruce Garrett), who was a talented salsa dancer as a child, returns to dancing 25 years later when he meets his new boss Rashida Jones (Julia) and seeks to conquer her through salsa. Bruce seeks out his old teacher (Ian McShane) and his sister Sam (Olivia Colman) to help him get his jive back. All this while competing with his work colleague (Chris O'Dowd ) who also tries to seduce Julia. The overweight character Bruce breaks the stereotype of a professional dancer and of traditional dance films. He is a funny, amiable character and the film excellently combines English humor with ‘latino spirit’ and dance. Most of the audience will not only laugh through the film, but will also be taken with the urge to dance salsa – whether or not they know the moves. Other key characters in the film are played by Rory Kinnear, Kayvan Novak, also known as the Phone Jacker, and the stunning Yanet Fuentes, a Cuban dancer who featured on the BBC1 competition ‘So You Think You Can Dance?’ The background music is authentic and vibrant, including tracks by Tito Puentes and Juan Formell - Los Van Van. Despite debates about the origins of salsa as a dance form, it is an integral part of Cuba’s culture and Cuban salsa – both music and dance – has been enriched with a particular style and rhythm. This film is bound to be a hit with salsa lovers and be a big conversation topic in salsa classes across Britain. Whether or not you’re interested in dance, I recommend everyone see this great, entertaining film. WASHINGTON, Feb 12 2014 (IPS) – If President Barack Obama wants to move more quickly to normalise ties with Cuba, it appears he has gained the political space to do so, according to analyses of a major new bipartisan public-opinion poll released here Tuesday by the Atlantic Council. 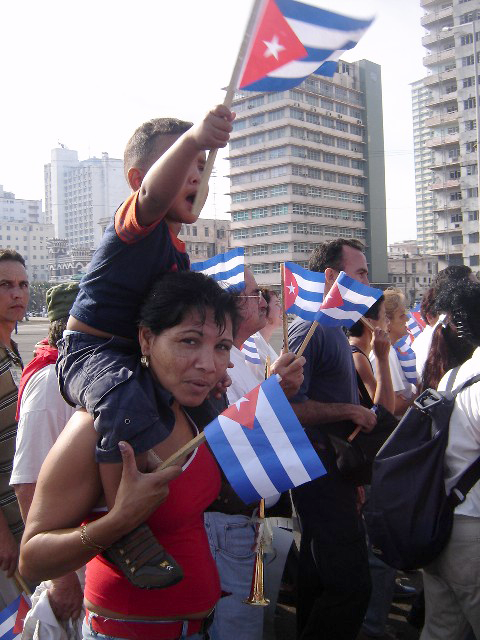 The survey, which was conducted last month, found that 56 percent of U.S. adults nationwide now support normalising ties or engaging more directly with Havana, while just over a third (35 percent) are opposed.